If you’ve ever wanted to live in a real-life episode of “American Horror Story,” now’s your chance. Book a flight to Detroit for what may be the best costume party of your lifetime. But don't come empty handed—and a quick trip to Party City will not cut it. Theatre Bizarre, which bills itself as “the greatest masquerade on Earth,” is equal parts giant house party, burlesque show, performance art piece, immersive theatrical spectacle, multi-story dance club, and fashion costume catwalk. The party unfolds simultaneously in painstakingly detailed rooms on eight floors of a gigantic neo-Gothic building that is home to the world’s largest Masonic Temple. It’s the realization of an adult child’s imaginative, playful, abstract dark carnival world. 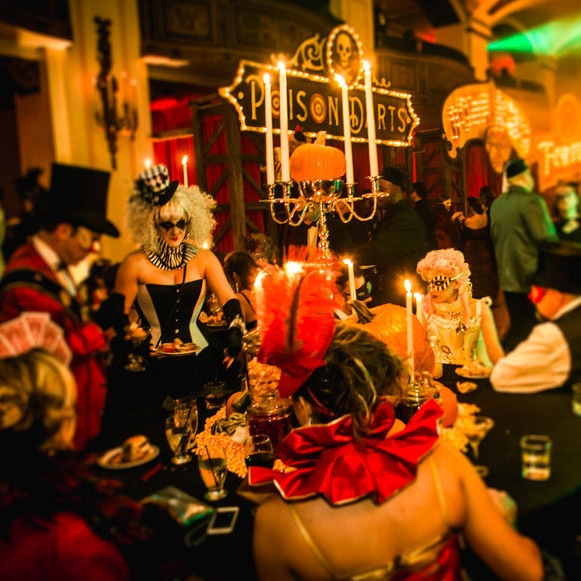 For the next two weekends, Theatre Bizarre will host an intimate masquerade gala event on Friday nights and a much larger masquerade party on Saturdays. Thousands of masqueraders, many who flock from across the U.S. to the Motor City, have devoted months and hundreds of dollars to devising an original look to compete with the legions of faithful revelers who return each year. Digital marketer and local resident Miranda Kaltenborn says she called Gothic dressmakers and steam punk costumers around the country to find the perfect dress that will transform her into the White Queen. She finally found one made by a company based in London. What first began as an illegal bonfire and homemade amusement park built alongside crack houses near the Michigan State Fairgrounds—once one of Detroit’s most dangerous, derelict neighborhoods—has transformed into perhaps the world’s largest masquerade party. But let’s get one thing clear: Theatre Bizarre is not a haunted house. “We’re not trying to scare people. I just want them to be entertained and have fun,” said co-founder John Dunivant, an artist and lifelong Detroit resident. “I’m inspired by carnivals and abstract worlds. Each year I wanted to create a different theme for the party.” For one party, he designed a Stanley Kubrick-inspired funeral parlor. Dunivant began producing Theatre Bizarre in 2000, when he and a group of friends got together to create artistic decor for a Halloween party at a friend’s house. Eventually, the event grew so big and popular that it had to find a permanent home. For the past few years, it has been hosted at Detroit’s historic Masonic Temple, which typically hosts touring Broadway shows, concerts, and sporting and private events. “I wanted to pay homage to the building we’re in, so the overall theme of the party every year is that we’re this secret society of Explorers Club using the sacred geometry of the Masons to open secret portals into this dark carnival that we’ve built,” said Dunivant. Sadly, this may be the last year for Theatre Bizarre, which Dunivant says doesn’t turn a profit and has put him in debt. For the thousands of tickets that are sold, they don’t cover the expense of putting on the world’s greatest masquerade fun house. To attempt to break even, Theatre Bizarre has expanded from two nights to four this year, running over two weekends. But twice the amount of entertainment means twice the amount of costs for the many performers and staff who are required to make it all function. “If we can’t come close to breaking even this year, it won’t be worth doing again,” Dunivant told T+L. Musician David J returns this year as the mysterious M.C. Nightshade, along with the Theatre Bizarre Orchestra, which will perform its new album Carpe Noctem. A highlight this year will be Violet Chachki, the Season 7 winner of RuPaul’s Drag Race, who will perform the second weekend at the Masquerade Gala on Friday Oct. 21st and in the Dirty Devil’s Peepshow on Saturday, October 22. Costumes are mandatory to gain entry to Theatre Bizarre. Tickets to the Friday night galas are $260, and entrance to the Saturday night parties are $95 and can be ordered online.